Salt Lake City, Provo and Surrounding Counties Find a local Easter Egg Hunt in Salt Lake City, Provo and Surrounding Counties! Looking for a local Easter egg hunt for your children? Or an Easter parage, Easter brunch or breakfast or other Easter events in Salt Lake City, Provo and Surrounding Counties? Scroll down this page and you will see all of thoses in Salt Lake City, Provo and Surrounding Counties, sorted by county. ALWAYS either see their website or call before you go to confirm the info, there are often last minute changes which they do not report to us! 934 South 1000 East, Clearfield, UT 84015. Phone: 801-525-2794. Alternate Phone: 801-525-2791. Email: [email protected]. Event date and time: Saturday, April 20, 2019,at 10 am SHARP!. Open: Click here for current open hours, days and dates. Directions: Payment: Cash, Free - no payments needed for anything. Concessions such as coffee and hot chocolate will be available for purchase. This event is FREE to attend and is for children ages 0 to 10 years. Fisher Park will be split into sections based on age, so all children will have a good chance to collect eggs. Special thanks to our friends at the American Legion Post 134 – these dedicated volunteers helped us fill thousands of eggs for the Egg Hunt! Clearfield Aquatic Center 825 South State Street, Clearfield, UT 84015. Phone: 801-525-2641. Event date and time: Saturday, April 20, 2019 from 1:30 am to 3:30 pm. Open: Click here for current open hours, days and dates. Directions: Click here for a map and directions. Payment: Cash, Debit cards, Visa or MasterCard. Click here for our Facebook page. The Egg Dive at the Clearfield Aquatic & Fitness Center (825 S State Street) is a wet and wild spin on the traditional Easter egg hunt. Children ages 0 to 12 years can splash in our pools and search for eggs to redeem for prizes. The Egg Dive will take place in two sessions: 10:30 a.m.-12:30 p.m. or 1:30 p.m.-3:30 p.m., with a special Parent and Child Egg Dive for 5-and-under during each session. Pre-registration is required for the Egg Dive: sign up at http://bit.ly/cafcegg18. Admission is $7.50 per child. Special thanks to our friends at the American Legion Post 134 - these dedicated volunteers helped us fill thousands of eggs for the Egg Hunt! 10351 East Highway 210, ALta, UT 84092. Phone: 801-742-9712. Email: [email protected]. Event date and time: Easter Sunday, April 21, 2019, at 11am SHARP! Meet in front of Alta Java at the Albion Basin Day Lodge. FREE. Meet the Easter Bunny and find some of his hidden treasures buried in the snow! Eggs go fast so make sure you are there on time. We will have three age groups: 4 & under / 5-8 years / 9-12 years. Galena Hills Park, 12500 S. Vista Station Boulevard (550 W.), Draper, UT 84020. Phone: 801-576-6570. Event date and time: Saturday, April 20, 2019, at 10 am. Meet the Easter Bunny and hunt for eggs filled with candy and prizes. Meet the Easter Bunny and join in the hunt for candy filled eggs and toys. Children 1-12 divided into age groups with accommodations for special needs. Rain or shine, the event goes on. Arrive early to secure your parking place and be ready in time, the whistle blows at 10:00 a.m. SHARP! 3443 W 12600 S, Riverton, UT 84065. Event date and time: Easter Sunday, April 21, 2019. Easter Egg Hunt & festivities will follow EACH of our 3 services! Easter is for the whole family at LIFESTONE CHURCH! You will enjoy our welcoming laid-back atmosphere, exciting live music, and interactive Kids Life & Little Life lessons. Be encouraged and inspired by God's amazing unconditional love and grace through the greatest event in human history: the resurrection of Jesus. Discovering the Biblical message about this event will help you experience EASTER and LIFE like never before! Please invite your friends, co-workers, neighbors, and family members. Your guests will enjoy... fun activities & gifts for kids, Easter bunny photos, Light breakfast & coffee, Celebration services, Live music. EVERYTHING IS FREE! Copperview Recreation Center, 8446 South Harrison Street (300 W), Midvale, UT 84047. Phone: (385) 468-1515. Event date and time: Saturday, April 13, 2019, from 9 am. For 12 and under. Northwest Recreation Center, 1255 Clark Avenue (300 North), Salt Lake City, UT 84116. Phone: (385) 468-1305. Event date and time: Saturday, April 20, 2019, at 9 am. For ages 3 to 12. NWRC Soccer Fields. Egg Hunt will be at Northwest on April 20th at 9:00AM. Please arrive early to ensure you don't miss it. THE EGGS GO FAST!!! Fee: $3.00. Central Park Community Center, 2797 S 200 East, South Salt Lake, UT 84115 . Event date and time: Saturday, April 20, 2019, at 9 am. City Park, 11000 S. Redwood Road., South Jordan, UT 84095. Event date and time: Saturday, April 20, 2019 from 9 am to 3 pm. Salr Lake CitThe Easter Egg Hunt will begin at 10 am sharp. More than just an Easter egg hunt, it's a celebration of Spring! They'll have raffles for trees from local nurseries and information on water conservation. For your entertainment, they've also arranged a special performance from the Utah Jazz Dunk Team, children's music performer Doctor Noize, and a Baby Animal Petting Zoo! The South Jordan Spring Spectacular, hosted by South Jordan City, will be held at the Softball Complex in City Park. The Easter Egg Hunt will begin at 10 am sharp. Utah Youth Soccer Complex, 8070 4000 W, West Jordan, UT 84088. Phone: 801-569-5160. Phone: [email protected]. Event date and time: Saturday, April 20, 2019, at 9 am. 6351 S 900 E, Salt Lake City UT 84121. Event date and time: Best to try elsewhere; this one sells out way in advance and is pre-registration only. 3003 N. Thanksgiving Way, Lehi, UT.Event date and time: Saturday, April 20, 2019, from 9 am. Bring the whole family for a fun-filled event at the annual Easter Eggstreme. At Electric Park, kids will enjoy massive egg hunts filled with prizes such as small toys, treats, and other goodies. We'll also have a special guest, the Easter Bunny, to meet with kids and take photos. In addition to the egg hunts, other activities include riding the cow train, jumping on inflatables, face painting, and more! Interested in adding breakfast to your Easter Eggstreme fun? Check out Easter Bunny Breakfast - which includes tickets to Easter Eggstreme! 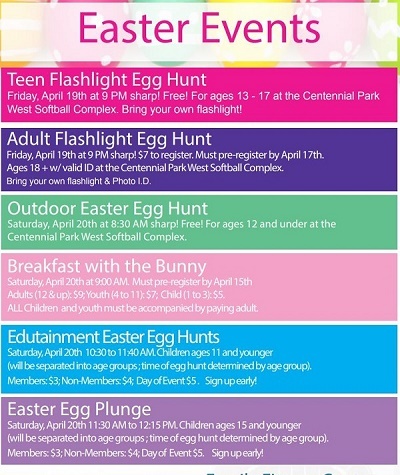 ELECTRIC PARK EASTER EGGSTREME - Bring the whole family for a fun-filled event at the annual Easter Eggstreme. At Electric Park, kids will enjoy massive egg hunts filled with prizes such as small toys, treats, and other goodies. We'll also have a special guest, the Easter Bunny, to meet with kids and take photos. SHOW BARN - 9:00 AM EASTER BUNNY BREAKFAST - Celebrate Easter with the whole family at Easter Bunny Breakfast. A delicious breakfast will be served, along with visits from the Easter Bunny. Enjoy pictures with the Easter Bunny, fun activities, dyeing Easter eggs, and visiting a bunny petting zoo! Each ticket also includes free admission to Easter Eggstreme! 1675 N. Freedom Boulevard #10g, Provo, UT 84604. Phone: N/A. Email: [email protected]. Event date and time: Call to find out IF they are having it this year; we cannot find any current information about this event, last year it was the Saturday right before Easter, from 9:30 am to 12 pm. Directions: Click here for a map and directions. Payment: Cash, only. Notes: Click here for our Facebook page. Register for the egg hunt on our website. There will be multiple age groups and multiple groups per each age group with only 15-25 kids in each group for egg hunting!. 784 W. Resort Drive, Midway, 84049. Event date and time: Saturday, April 20, 2019, and Friday, the day before. Zermatt Spring Extravaganza is a 2-day Event held at Zermatt Resort in Beautiful Midway Utah. Zermatt Spring Extravaganza is a family-friendly event. As winter turns to spring come and enjoy a weekend full of bright and fun activities including floral arrangement classes, children's activities and a market complete with food, crafts, and many other booths. Children's Activities include face painting, a bounce house, Easter Bunny visit and as always the free Easter Egg Hunt! The Hunt is on precisely at noon so you'll want to head over a little early to the Hunt so you can get a good spot to watch all the fun. 450 South 600 West, Heber City, UT 84032. Phone: 435-654-5601. Event date and time: Both the weekend of and the weekend before Easter on Thursday, Friday and Saturday; multiple departure times. Best to book in advance.. Come and ride the train with the Easter Bunny on this kids train experience. Includes a fun 40 minute round-trip train ride to our Charleston siding with the Easter Bunny on board. There will also be a magician at the depot performing magic for you! Each child will receive their own Easter Egg! You'll also enjoy a baby animal petting zoo at the depot! Mountain View High School,, Orem, UT 84097.Email: [email protected]. Event date and time: Saturday, April 20, 2019, at 9 AM to 10 am. Bring your whole family for a fun Easter Egg Hunt! This event will be held at the Mountain View High School Football Stadium and the West lawn of the Orem Fitness Center. Hunt is for all children ages 0-11. 175 South 400 East, Orem UT 84097. Event date and time: Saturday, April 20, 2019, from, 11 am to 12:30 pm. Email: [email protected]. Free. Bring your whole family for a fun Easter Egg Hunt! This event will be held at the Mountain View High School Football Stadium and the West lawn of the Orem Fitness Center. Hunt is for all children ages 0-11.